Our team’s trip to Coaque was quick, but it was efficient and fruitful. In about 24 hours, we formed a new partnership with the local NGO Plan Internacional, moved the contents of our digital library center, spoke to community members about the program, visited the former second site of our program La Playita, put on a well-received workshop about drug addiction, and set goals in place for the project’s future, among other things. After the long drive from Quito, we first visited our digital library center in Coaque. It was very exciting for me to see the project in action for the first time. The blue cement room with a metal roof contained some desks, nine ChromeBooks, chairs, and of course the KoomBook digital library server. I felt a pang of pride seeing the Tufts logo outside and seeing our work as part of Tufts International Development tangibly in front of my eyes after two years of work on this project. 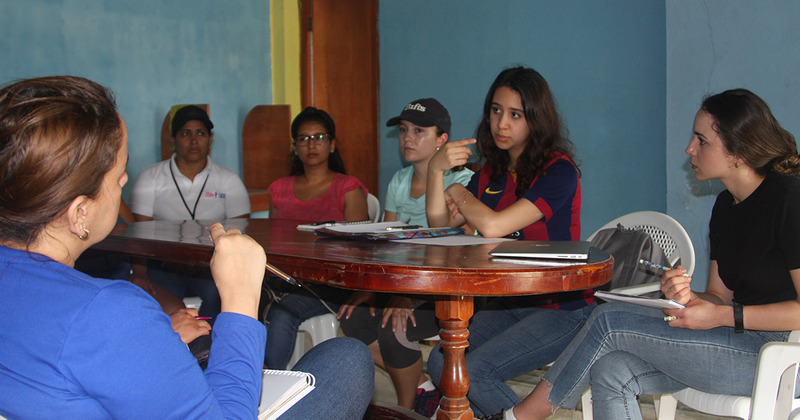 We then met with Plan Internacional, an NGO that works extensively within Coaque, and they agreed to host the digital library in their community center as our current space is no longer available for use. We began to work out the details of our partnership, and they showed us La Playita, where we used to have a KoomBook. Hopefully electricity will be restored to the area so that we can reopen the center for use in the near future. La Playita was heavily affected by the 2016 earthquake, and some people are still living in refugee tents provided by the UN. The next day, we woke up early to move the old center’s materials to the new Plan Internacional location. We then transferred the technology to the Plan headquarters while they improve the security of their center in Coaque. Finally, we returned to Coaque to put on an educational workshop about drug addiction with team member Camila Rovalino leading the way. This topic struck a chord with community members, some of who shared their personal stories struggling with drugs or as addicts themselves. It was a salient moment of openness within the community, and in that moment, I realized just how much trust is shared between our organization and the local community. The TID team was then invited to the house of Don Luber, a prominent leader in “the Coaque family,” as he put it. We conducted an interview with him about the impact of the KoomBook on the community, and then he graciously invited us to lunch with him. His family had prepared ceviche with rice and plátanos fritos, a typical coastal Ecuadorian lunch. Prior to this trip, I had never spent time in an impoverished town like Coaque. Although I am glad that our KoomBook program has been a success, I wish that there was more we could do for these wonderful people.